According to her own recollection, there was never a time when she didn't want to sing. The youngest of four children born to Sicilian immigrant parents, Elisabetta Caradonna grew up during the Great Depression, when most forms of entertainment were community-based and necessarily inexpensive. One of the most popular was the marathon dance contest, which would include ad-hoc intermission acts that popped up when the dance bands took their breaks; these entertainers were paid only with whatever money the audience cared to toss on to the stage. With her older brother Rosario as her impresario, Elisabeth began to sing at these events at the age of nine. She was a runaway hit, and soon she was doing well enough to be hired to sing with a real orchestra during intermissions at a Newark movie house, where she and her brother could make ten dollars a week. When Elisabeth was twelve, she was unexpectedly visited backstage by Edith Saylor, the wife of the music director of a big Presbyterian church near the movie house. Mrs. Saylor, who had once dreamed of becoming an opera singer, was struck by the talent of this child and offered to give her lessons free of charge – the one stipulation being that Elisabeth would not sing for money any more. The parents agreed to the arrangement and Sario periodically drove Elisabeth to Upper Montclair, where the Saylors lived, for her training (which included piano instruction from the church music director). Elisabeth Carron’s only additional study was at Enrica Clay Dillon’s Deertrees Opera Company in Harrison, Maine, where she coached one summer under the director’s sister Josephine. Josephine Dillon was a renowned West-coast actress and teacher who had taught Clark Gable (she was his first wife), Errol Flynn, Gary Cooper, and Cary Grant. At nineteen Elisabeth was in the ensemble of a production of The Chocolate Soldier at the Paper Mill Playhouse in Millburn, NJ, and a few years later performing solo at the Condado Hotel in San Juan, Puerto Rico. After World War II, she took the expedient of changing her name to Carron, since it was not easy at the time for one with an Italian name to get work with an American opera company. She joined the San Carlo Opera Company, a highly respected touring group of over 100 artists, which, under the brilliant management of Fortune Gallo, had the distinction of being the only grand opera company in America to operate consistently at a profit. With San Carlo, she honed her skills in minor roles: Annina (La Traviata), Frasquita (Carmen), A Priestess (Aida). With a soprano voice “of the finest kind … pure, immaculately produced, and capable of astonishing power and color" (Paul Hume, The Washington Post), she was one of the great lights of the New York City Opera in its heyday, judged by critics to be "radiantly communicative" and "a transcendent artist." Carron’s repertory with City Opera expanded over the next few years to include the role of Birdie in Blitzstein’s Regina (1958), of which Opera News declared that she "all but stole the show." This was an outstanding triumph, both on the City Opera stage and on the acclaimed Columbia recording, which Raymond Ericson included in the New York Times "Best of Opera" discography. She also won exceptional praise for her evocation of Anna Maurrant in Kurt Weill's Street Scene (1959), and for her Mimí in La Bohème (1960). Meanwhile she debuted with other opera companies nationwide in starring roles: Glauce (in Cherubini’s Medea) in Dallas with Maria Callas, Teresa Berganza, and Jon Vickers (1958); Liù (in Turandot) in New Orleans with Richard Tucker and Birgit Nilsson (1958); Butterfly in Detroit, Cincinnati, and Caracas, Venezuela. She sang Liù in Philadelphia (1959) and Houston (1960), Musetta in Dallas (1961), and in 1962 bowed with the San Francisco Opera as Constanze in The Abduction from the Seraglio and Violetta in La Traviata. The California critics called her "the discovery of the year." 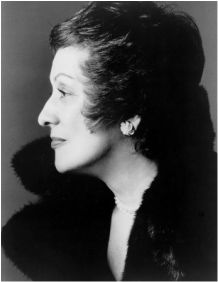 Ultimately Elisabeth Carron’s repertoire included a fifth Puccini role, Manon Lescaut, and 30 more roles in operas or oratorios of other composers. She shone even in the operas of Richard Strauss, which she initially had hesitated to tackle, as Aithra in Die Aegyptische Helena, Zerbinetta in Ariadne auf Naxos, and Daphne. In April of 1980 Carron returned to Houston in her triumphal role of Birdie in Regina. On this occasion, Musical America reported that she “stole the show from all of them with her beautiful voice and touching portrayal of Regina's poor, broken, driven-to-drink sister-in law." She continued to sing publicly well into the 1980s, at the Edinburgh Festival with the Washington Opera in Menotti’s The Medium, and as the U.S. Representative to the first Worldwide Madama Butterfly Competition in Tokyo. From 1988 to 1996 Carron was on the faculty at the Manhattan School of Music in New York, giving many master classes for opera students, and since then she has served on several juries for vocal competitions, including that of the Licia Albanese Puccini Foundation and the Met Opera Regionals. Elisabeth Carron lives in New York City with her husband Marte Previti, a chemical engineer, entrepreneur in the import/export business, amateur photographer, and art collector and restorer. They have two daughters, interior designer Lisa Rose and architect Marcia Previti, and a grandson, Alexander Gumpel, who is majoring in conservation biology.